For the Peabody Symphony Orchestra, 18 months of planning and $60,000 in expenses all led up to one night at Lincoln Center. On a Monday afternoon last April, Hajime Teri Murai settled behind the piano in his Peabody Conservatory studio. The Peabody Symphony Orchestra's music director had much on his mind, but at this moment, foremost was Gustav Mahler. Murai had just concluded a dress rehearsal of Mahler's Das Lied von der Erde, a darkly beautiful symphony of six songs, and there were problems. He considers the piece to be the most difficult music Mahler ever composed, harder to play than even the composer's ninth symphony: "It's a piece that you never solve all the questions about. It has so much depth, you're never going to get tired of it, [but] no matter how much you play it, it's always going to be difficult." After a month's work the Peabody players were reaching the proficiency to play it properly, if they paid attention. But they were still missing entrances and failing to count some of the work's complex rhythmic passages, and Murai didn't have much more time to prepare them. Tomorrow they would play the work in concert at Peabody's Friedberg Hall. Three days past that, they would repeat the performance in New York, at Lincoln Center's Alice Tully Hall. Now Murai wanted to go over a few troublesome spots with the principal cellist, graduate student Barbara Kleewein, and the program's mezzo-soprano soloist, Theodora Hanslowe, Peab '92. In summer 2004, Murai had begun assembling the New York concert. He needed a program that would show off his orchestra and, he hoped, attract New Yorkers who have their choice of concerts by the world's foremost players. "Every professional orchestra in the world goes to New York," he said. "We don't need to play another Brahms symphony." Instead, he programmed a pair of contemporary works, composed by Peabody faculty members Christopher Theofanidis and Michael Hersch, Peab '97, that had never been performed in the city. For a third contemporary piece, Marina Piccinini, on the Peabody flute faculty and a soloist of growing acclaim, suggested Gran Danzón: The Bel Air Concerto, a flute concerto by Cuban composer and jazz musician Paquito D'Rivera. From the start Murai wanted Hanslowe, a rising star in American opera, on the bill in New York. Her schedule had done much to determine the concert's date. She books years in advance, but when Murai called her in 2004, she consulted her calendar and found that in April 2006, between performances with the Baltimore Opera in Dead Man Walking and the Metropolitan Opera in Handel's Rodelinda, she had a week free for a Peabody commitment. Murai signed her up. She was pleased to do something for the conservatory where she'd earned an artist diploma, and delighted to sing Das Lied von der Erde. During her first year as a Peabody student in 1988, the orchestra had scheduled the piece. A few days before that concert, the faculty member slated to sing the mezzo role had cancelled, and Hanslowe was called to substitute. "I had not even heard them before," she said of the songs that form the piece. "I had to learn them in two or three days. It was really a mind-blowing experience." In Murai's studio, Hanslowe patiently worked with the student cellist, Kleewein, to get a few tricky passages right. At the piano, Murai stood in for the rest of the orchestra, pointing out where Kleewein was not correctly counting certain measures. Mahler had written an extraordinarily complex score of different implied meters and rhythms. The effect on the listener is sublime, but the score makes great demands on musicians. In the just-concluded rehearsal, the Peabody orchestra had done some fine playing, but its concentration had wavered. 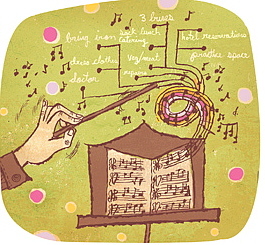 The concert program would be long, more than two hours, and would demand sustained attention by young musicians who sometimes let their minds wander. Murai said, "That's the difference between working with pros and working with students. We've got students who have the technical capabilities of many professionals. But they don't all have the experience to know how to be performance ready consistently. So they're going to stop thinking about what they're doing. They have so much innate ability, they tend to rely on their instincts. They think they'll just sense their next entrance. Tchaikovsky or Schumann you can play by feel. But in all the pieces on this program their instincts still lead them astray." The necessary level of concentration hadn't been present for the full length of the dress rehearsal and Murai had snapped at the players a few times. The run-through of the flute concerto had been particularly rough, with messed-up rhythms and missed entrances that threw off Piccinini, the soloist, and once actually brought the piece to a halt. 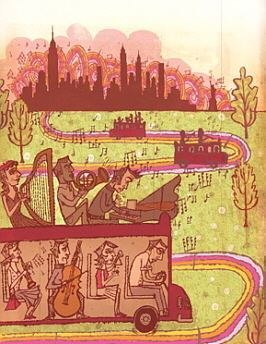 The score is an intricate combination of jazz, classical, and Cuban elements that D'Rivera had composed for Piccinini. Part of its difficulty, Murai observed, is that how the notation looks and how the music is supposed to sound do not always match. In places, for example, the orchestra has to swing like a jazz band, but that can only be suggested in musical notation; it has to be felt. "There aren't a lot of downbeats," Piccinini observed. "There are a lot of upbeats, up in the air, which is great for dancing but really hard for an orchestra." She usually played from memory, but after the dress rehearsal she was considering using music for the concerts, in case the orchestra was ragged again. Nevertheless, after pulling on his jacket to go home for the evening, Murai seemed relaxed. Tomorrow he would put everything on the Peabody stage and see what happened. The concert in New York would be the biggest performance of Peabody's season, an expensive, complicated undertaking, but a rare opportunity for the conservatory's students. Peabody's last appearance at Alice Tully had been five years ago, and Murai wasn't sure when the orchestra might go back again after this week's concert. "Touring expenses have gone through the roof," he said. The single concert four days hence would cost the conservatory $60,000 for rental of the hall, transport, food, stagehands, promotion, hotel, soloists, and other expenses. There wasn't room in Peabody's budget for many $60,000 nights. But a concert at Lincoln Center would be a formative experience for the student musicians and valuable promotion for the conservatory, a statement that down the road from New York and Philadelphia there was another noteworthy music school. "To be taken seriously you have to play New York," Murai said. When an orchestra travels to an out-of-town venue, the performance is called a "run-out." The term is deceptively casual, as if the ensemble were running out for eggs and milk. Murai and the Peabody staff had been working more than 18 months to bring off this one night on a New York stage, laboring over contracts, scheduling, transport, food, lodging, promotion, and, not incidentally, music. To succeed, everyone involved had to get right a staggering list of logistical and musical details. In the last few days before the concerts, everyone sweated over individual responsibilities and tried to anticipate what might go wrong. In his office, Peabody stage manager Darryl Carr reviewed the contents of a binder he'd assembled for the run-out. It was full of phone numbers, the floor plan for Alice Tully Hall, the stage layout, details on the hotel, and lists of equipment that would need to be packed and transported to Manhattan. Carr scanned the latter and said, "Lot of percussion. Lot of toys." Carr is responsible for staging about 1,000 events per year at Peabody, everything from symphony concerts to instrumental competitions to individual student recitals. For this week alone in just one of Peabody's halls, he had to oversee 11 recitals and 15 rehearsals. Every Peabody event and rehearsal required its own stage set-up with chairs, music stands, and equipment. "Harpsichords are popular this week, for some reason," he complained. "Driving me crazy." Teresa Perez, director of concert operations, was responsible for planning the musicians' transport, feeding, and lodging. Three buses would depart from the conservatory early Friday morning. So the players could eat before rehearsing in New York, she had arranged for a caterer to deliver bag lunches at 7 a.m. and had compiled a detailed list of dietary requirements to accommodate the vegetarians and vegans. Reserving the hotel had been a particular challenge. Perez had to find one located near the concert hall that would not demand a two-night weekend stay and "didn't cost $400 a night." She'd booked rooms at the Wellington Hotel on 55th Street, which made her smile. In years past, the Wellington had been used by a variety of not-so-good ensembles as a place to hold auditions. Perez, a cellist, had actually auditioned there herself, for a job with an orchestra in Rio de Janeiro. As director of ensemble operations, Linda Goodwin had negotiated the concert date at Alice Tully. She was tracking all the expenses: hall rental, the buses, the truck, the union stage crew and a piano tuner in New York. She had a mental list of all that could go wrong: "The truck could get lost. A bus could break down, which happened once on a return trip from New York. We could lose a player, or lose music, or lose an instrument. Flu and strep have been going around, so somebody could get sick. A soloist could get sick. Some of the basses need their instruments for auditions in Philadelphia the day before the concert. Will the bass cases fit under the bus on Friday, since they can't go on the truck Thursday? The program requires a piano, a celesta, two harps, and lots of percussion and Alice Tully has a smaller stage. How many string players will fit after all that stuff is on stage?" Goodwin paused, then said, "I'm looking forward to next week when this will all be over." Orchestra member Robin Massie was looking forward to the performance. She was about six weeks from graduating with a performance diploma in viola. She had begun violin lessons at age 8, but in her first year of high school, she'd picked up a viola that her teacher, Ron Smith, had laying around. "I put it to my shoulder and pulled the bow across the strings and knew I'd found my voice," she said. Smith gave her the viola, which she'd played through her undergraduate years at the University of Maryland. She already had performed a few times in New York, once with a high-school orchestra in Carnegie Hall. "It's always exciting," she said. "I remember looking around Carnegie and thinking, Mahler stood here." The evening of the concert at Peabody, Carr already was complaining that he needed more sleep. The night before, he had lain awake, his head full of all that had to happen — and could happen — in New York. At least this time he'd not had bad dreams. Two years before, when he'd worked on the gala celebration of the conservatory's massive renovations, he'd had nightmares about the stage collapsing. Tonight, he had a more immediate concern: a bassoonist who had stumbled backstage at Friedberg Hall and suffered a nasty lump on her shin. He dispatched one of his student stagehands to fetch ice from the machine at Peabody's Elderhostel building. Meanwhile Goodwin checked in musicians as they arrived for the evening's performance, handing each a New York itinerary and making sure they'd brought everything they needed for tonight's concert. She also scrutinized outfits. At the dress rehearsal, she had admonished the young women not to wear shirts that might hike up as they played, exposing their midriffs. "No Britney Spears tops," she'd warned. Backstage, strings warmed up in one room, woodwinds in another, brass in a third. Someone had scrawled on a chalkboard, "The steady march toward madness begins!!!" Murai scurried about, music in hand, holding last-minute conferences. He stopped a violinist and pointed out something in the score, then went looking for a piccolo player. When he found her, they conferred for a moment and she marked her music. He moved on to another player and said, "You've got to listen to the harp and match her there, because she can't change." Next he chatted with Piccinini and Hersch, making more last-minute notes. When Murai took the stage for the opening downbeat, the audience was disappointingly small. The program opened with Theofanidis' Rainbow Body, a lovely, melodic 13-minute composition that three years earlier had won the world's largest competition for new music, the Masterprize Competition. The piece's stirring conclusion was punctuated by several cheers from the musicians — hurrahs that were actually in the score, added by Theofanidis after he'd heard some exuberant London Symphony players cheering during a rehearsal. The Peabody musicians seemed to love it, and as Theofanidis listened he heard an unbroken intensity that moved him. In the audience, Theofanidis sat next to Hersch, whose composition Arraché was next on the program. Hersch, who didn't begin serious pursuit of music until he was 18, had studied composition at Peabody and in only a few years had established himself as one of the new stars of American composition. His Arraché is a technically challenging piece that ends in a quintuple fugue, demanding the sort of concentration that had wavered during rehearsal the day before. Tonight, the orchestra was sharp, its concentration focused. Later Hersch would tell them, "It's not often I feel that orchestras are communicating, even professional orchestras, and I feel you guys are really doing that." Through the D'Rivera and the long concluding hour of Das Lied von der Erde, the players maintained their focus and played superbly. Afterwards, Massie, the young violist, succinctly, and accurately, characterized their playing of the Mahler: "With fury and precision." At a Thursday touch-up rehearsal the morning before they headed for New York, Murai told his musicians, "You were sensational the other night. Now you get an opportunity to be more sensational." Before the rehearsal commenced, Carr strolled in clutching a very large coffee mug. Someone asked him, "What's the weather forecast for New York?" Ten minutes before the start of rehearsal, Murai arrived, dressed as usual all in black. Immediately he grabbed his score and conferred with first an oboe player, then a harpist. He was in a chipper mood. When Theofanidis walked up to chat, Murai said, "When you're rich and famous, will you remember us?" The players kept their concentration as Murai led them through music so complex that Mahler had once asked the conductor Bruno Walter, "Have you the slightest idea how to conduct this? I haven't!" At 10:30 a.m., Goodwin addressed the players. "I know you're not a morning orchestra," she said. "So remember the bus is leaving at 7:30 tomorrow. I did scrutinize outfits the other night. There were a number of ladies with open-toed shoes. Be aware that I will be taking black gaffing tape to New York and you will find yourself with tape on your open-toed shoes." Murai led the orchestra through Theofanidis' Rainbow Body. Several of the players smiled when they came to the cheering sections; everyone seemed in a buoyant mood. "There are a lot of nice things happening, guys," Murai told them. "You have a different energy now because you've been through it. Violins, we still have intonation issues at letter 'G.' Can you resolve that? It's at the start where we lose you. Piano, at 'C' just let it ring until the strings start. Keep the pedal down. Trombones can give more, trumpets too." They played the Hersch piece, and Murai continued to tweak. "Bassoons need to bring their parts out more. Clarinets, the figure at 22 and 24 needs to be more prominent. More oboe, too. 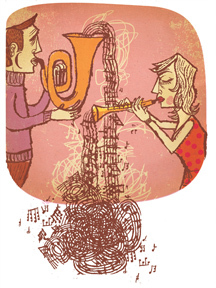 We need an edgier, more metallic sound from the trombones, not so rounded." They skipped the flute concerto to concentrate on the Mahler in the time they had left. To sharpen their sense of how it should be played, Murai had the wind players sing a passage in unison. Some members of the string section chuckled, and Murai said, "Don't laugh, you're next." On their turn, the string players hammed it up and now everyone laughed. The Mahler ends with trombones and woodwinds softly sustaining the final chord under brief arpeggios from harp and mandolin. After the final note, Murai lowered his baton and said, "Don't you love this? It's just incredible." Friday in Baltimore dawned drizzly, and at 7:15 as the orchestra filed onto the buses for the trip to New York, the day's first crisis was missing sandwiches. Not an errant turkey here or a wayward roast beef there, but all the sandwiches. In less than 15 minutes, the buses were due to roll off for the four-hour drive to Alice Tully Hall. Where was the caterer with everyone's lunch? Perez and Goodwin began to think of a contingency plan. Would the buses have to make an unscheduled stop somewhere along the New Jersey Turnpike? A few minutes before the scheduled departure time, Perez stepped onto the lead bus clutching white paper sacks. "I've got two vegans," she announced. The lunches had finally arrived. So had a flute player delayed by a late taxi driver, the last of about 100 musicians to check in. (Unfortunately, violist Robin Massie was not one of them. She had to remain in Maryland to care for an ailing aunt.) The trio of buses could head out. The lead bus carried the Peabody stage crew, who would unload the equipment truck in New York, and the percussionists, who filled the back seats. Anastasia Pike, a harpist, grabbed the front seat because she planned to nap and wanted to be as far from the drummers as possible. "I figure they'll be banging on stuff," she said. She didn't get much sleep after someone popped a cassette of Wayne's World into the bus' video system, then stagehand Matt Mattera, a trumpet player at Peabody, loaded the new CD from his rock 'n' roll band, Infusion. The drive proved uneventful and swift, and the buses slid into parking spaces by the Alice Tully Hall performers' entrance at 11:35. Goodwin asked everyone on board to relax because the contract with the hall did not permit entry until noon. The musicians chewed their sandwiches and fresh fruit, placed calls on their cell phones, and eyed the Tower Records shop across the street. At the stroke of noon, Carr and his crew began hauling gear from the truck and setting it on the loading dock, where union work rules dictated they couldn't touch it again; the hall's stagehands would take it from here. There were cartons of percussion gear, a gong, a marimba. Stools upside down in a drum carton, their legs in the air. Three large bass cases, one bearing a sticker: Bass — The Lowest Form of Music. Two hours later, everyone found a seat on the Alice Tully stage and Murai held up his hand to begin one last rehearsal. His assistant conductor, Ana Zorana Brajovic, went from seat to seat, listening to what the audience would hear. Murai and Hanslowe had been working all week to keep the orchestra in the Mahler from overpowering her when she sang in her lower register. Brajovic was working to ensure that wouldn't happen in the concert. After a few sections, Murai told the players, "It's a live hall, which will open the tone up but puts a premium on your ability to play softly. You guys sound great." For more than two hours they rehearsed before he released them to walk across the Lincoln Center campus for a chicken dinner, provided by the Juilliard School's cafeteria. At 7:35 p.m., more than 12 hours into the day, Carr yawned backstage and said, "We've got three hours to go before load-out. I'll tell you this: That stuff's gonna hit the street fast." As musicians filed past Goodwin, many clutching plastic bags with new purchases from Tower Records, she checked outfits. Everyone was in proper concert finery, nary a bare midriff or open-toed shoe in sight. A few minutes before the opening downbeat at 8 p.m., Murai came in, dressed in white tie and tails, drinking from a bottle of citrus-flavored water, brand-name "Perform." He had been across the street at a friend's apartment, where he'd been able to grab a quick nap and, as he put it, "clear my mind and then load it back up again." When he stepped on to the stage and strode to his podium, Murai was confident of his orchestra. He later said that from the first note of the day's earlier rehearsal, he knew his players were primed for a great performance. Behind him as he raised the baton for the opening downbeat, the size of the audience was disappointing, with less than half the hall's 1,100 seats filled. It was too bad the crowd wasn't bigger because, as Murai had sensed, the musicians were on their game again. 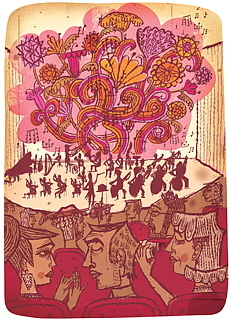 In the audience, Theofanidis was immediately impressed by the power of the orchestra's sound in the New York hall as they launched into Rainbow Body. After excellent readings of that piece and Hersch's Arraché, the orchestra dove into the D'Rivera flute concerto. Piccinini, in a deep red gown, played it safe and again read from music, but as they had in the Baltimore concert, the orchestra players turned in an attentive performance that drew praise from the flutist. Murai said, "They made some mental mistakes they hadn't made before, but nothing you would notice from the audience. It was too long of a day for them without a break. They never had a chance to go to their hotel and relax, even for an hour. That's the reality of touring." At the intermission, Murai came backstage and toweled off his glistening face. The players drank cups of ice water and talked softly. They knew they were playing well, but they still had to contend with the Mahler, meaning they would need to summon one more hour of intense concentration. Mahler based his 1908 cycle of six songs on German adaptations by Hans Bethge of some melancholy 8th-century Chinese poetry. The first song has the refrain, "Dark is life, is death," and ends with the macabre image of an ape howling in a graveyard. The shorter songs in the middle meditate on loneliness, youth, beauty, and the fleeting joy of being drunk in the spring. The work concludes with a final, complex, enormously difficult song that's nearly as long as all five that precede it. Said Murai of the last movement, "Nothing is the same twice. It's the same material, but it never comes back in the same version. He adds a quarter-note here, he adds a bar there, he adds a bar-and-a-half here, he throws in parts in counterpoint to each other, he extends one, he doesn't extend the other. And the changes are not things you can predict." Though it had to be tired, the orchestra still sounded strong and confident as it backed Hanslowe and tenor Michael Hayes. The players kept their concentration as Murai led them through music so complex that Mahler had once asked the conductor Bruno Walter, "Have you the slightest idea how to conduct this? I haven't!" In the audience, Hersch listened to the climax and thought it was among the best he'd ever heard. The problems of earlier in the week were history. When it mattered, on the New York stage, the players delivered. Said Murai, "For a student orchestra to come into New York and play that program is impressive. To play it at the level we played it, especially given where we started. . . . They came from being unfamiliar with all of these pieces to delivering that performance. I was very proud of them." Backstage, as the players had begun the long final movement, Carr had uncapped a bottle of spirits and poured celebratory drinks for Perez, Goodwin, and the rest of the behind-the-scenes staff. Immediately after the concert, the musicians would head for the lobby and a reception, and the Peabody crew would load the truck for the trip back to Baltimore the next day. Tired as he was, Carr was thinking about heading downtown to find some jazz. Almost everything had gone right as planned; a day in which late sandwiches constituted the biggest crisis was a good day. Carr picked up the binder with all his papers and charts and checklists. He peeled from its cover the handbill for the concert and dropped it in a trash can. Job done.